A real truck was used at the 2003 IDPA Nationals, not a cardboard fake. Such realism aids in practicing for various situations as well as enhancing the fun in its own right. If you are serious about developing and maintaining defensive handgun skills, regular participation in the formal competition of one of the practical shooting sports is the best way to do this. Simply put, in these formal shoots there are no excuses. You have to do it right the first time, on demand and when the timer goes off. Before you tune out, thinking, "This isn't for me; I get enough stress in my everyday life; I don't need more," consider this: What is a real-world encounter if it's not a situation where you have to do everything right the first time and on demand? Practical shooting contests will give you an unbiased evaluation of how well you have learned your skills. Please understand, though: What you will not get is training. A match, by definition, is a contest where your learned skills are tested (although many fellow competitors are more than willing to share their knowledge if asked). The sport of practical shooting can best be experienced in events sanctioned by the United States Practical Shooting Association (USPSA) or the International Defensive Pistol Association (IDPA). Both groups have their pluses and minuses, their vociferous supporters and detractors. Of the latter, there are those who counsel against competing, offering such comments as, "the courses of fire aren't realistic," "the targets don't shoot back" or "the rules [of either discipline] are not practical, and following them will get you killed on the street." How many folks would come to a match, pay their entry fees and learn that the solution to the problem is to not shoot and run away? Looking at the other complaints: "Targets don't shoot back." Are these gunfighting gurus suggesting we should all shoot and be shot at in a contest? "The rules are impractical." Sure, they are by their very existence because the first rule of any real fight is that there are no rules. It's obviously great sport to criticize and opine about the problems, but I'll also note that most of the naysayers don't show up to help or correct the poor, unenlightened volunteers who are running the matches. Revolvers have made a comeback thanks to IDPA rules. One is generally hopelessly outgunned in USPSA with the wheelgun. Nonetheless, the revolver still serves well as a concealment arm, and IDPA is the place to practice with it. Both had as their original intent the concept of testing defensive handgun skills in a sporting environment. As USPSA matured, there was an incremental but finally overwhelming shift from self-defense stages to being more "run and gun." Also, since there were but few limitations on gun modifications (and the leadership refused to install any), guns morphed into being very specialized, high-capacity, electronic-sighted, compensated tools that required carefully tailored, handloaded (to high velocity) cartridges. These loads accentuated the effect of the compensators. These guns now can be shot very well and very fast, but they certainly couldn't be called practical any longer. As guns lost their practical nature, gear tagged along, with holsters now more resembling orthopedic devices than any concealed carry holster. There was some effort made to give those members who did not wish to take part in this arms race a venue in which to compete. This was dubbed Limited Class, but the handgun-restriction rules were not sufficient to forestall yet another arms race. The result was that the limited-class gun, while lacking optics and compensator, still had to be a high-capacity gun, and, with minimal restrictions on caliber, a handloaded .40 S&W became the caliber of choice to win. With the race gun and the (un)limited gun, the perception remained that you needed a high-capacity, handload-sensitive, custom gun to win. Reality had no chance. These factors alienated some of the regular shooters but, more seriously, turned off many who might otherwise have joined USPSA and shot the matches. IDPA, and to a lesser extent USPSA, matches use "real world" props. Here, Dave Koebensky of Wolff Gunsprings has his "phone call" interrupted during an IDPA match stage. These are some of the causative factors that led, in 1996, to the founding of IDPA with goals best identified in a quote from the IDPA handbook: "Defensive shooting as a sport is quite simply the use of practical equipment, including full-charge service ammunition, to solve simulated real-world self-defense scenariosÃ‚&apos;¦ Shooters...are required to use practical handguns and holsters that are truly suitable for self-defense use. 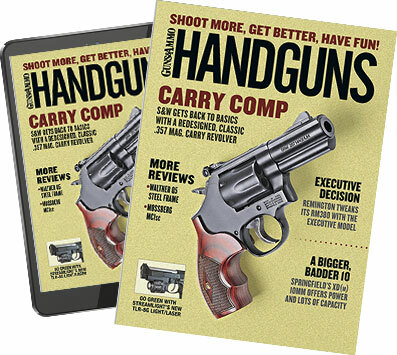 No 'competition only' equipment is permitted..." As a cofounder, I saw IDPA as a means to redirect the sport of practical shooting back to being the defensive use of a handgun. IDPA created four divisions for handgun types and calibers, devised a scoring system and target that reward accuracy over speed and structured the competition so as not to have overall winners. In IDPA you can win your division, but there is no overall ranking of the entrants because each action type and caliber can affect the shooter's performance. As IDPA membership began to near the 8,000-member mark, USPSA, with about 12,000 active shooting members, created new divisions. Not surprisingly, these new divisions mirror those of IDPA. USPSA also adopted restrictions on gun modifications, caliber, holster types and mode of dress. "Crossover" guns such as this Glock Model 35 in .40 S&W can be used in both USPSA and IDPA contests (with a holster change for IDPA). The philosophical difference between the two is reflected in the design of courses of fire and how they are shot. How USPSA matches are engaged by the competitors is defined in USPSA rule 1.1.5.: "IPSC shooting is freestyle. Competitors shall be permitted to solve the challenge presented...and always be allowed to engage targets on an 'as and where visible' basis." With this approach, any use of tactics such as getting behind cover to shoot or reload is counterproductive since scoring is heavily weighed on time. Thus, the less time wasted not shooting, the better your score. IDPA addresses this directly, and I quote from its rule book: "...there is a long history of action pistol-shooting stages that have become common after 20-odd years of IPSC [author's note: USPSA] competition. Many of these are not at all practical simulations of a self-defense encounter...We must not let this type of course design become part of IDPA." IDPA scoring is, as is USPSA, time-based but with time penalties added for failing to perform certain basic self-defense actions such as using cover and not reloading while exposed to a threat. These make IDPA stages intrinsically more self-defense oriented, and, for better or worse, IDPA shooting is definitely not freestyle. One other significant difference between the two is the presence of, or the lack of, financial incentives--i.e., prizes. At USPSA regional and national contests the winners can get some good loot if they shoot well. At the same-level events in IDPA you get a plaque or a trophy for shooting well, and any donated loot is awarded by random drawings. What does all this mean to the potential new shooter who wants to use his factory-standard Beretta, Taurus, Smith & Wesson, SIGARMS, Glock, 1911 or revolver? Not much since there is now a place for all these guns in either sport (with some restrictions on barrel lengths, barrel porting/compensators, caliber and other modifications). My observation is that the level of shooting difficulty is generally higher for USPSA events, where targets are farther away, than is found in IDPA, where the majority of shots are mandated to be less than 15 yards. USPSA stages generally require more rounds to be fired compared to IDPA, where the round count is limited to no more than 18 rounds per stage. This variance speaks to IDPA's focus on keeping the stages/scenarios reflective of self-defense encounters. Fewer rounds fired also means less movement in a stage. A USPSA "race gun." Love it or hate it, these guns have defined action pistol shooting for more than a decade. USPSA events, fairly or not, are perceived by many to be run-and-gun affairs, with competitors sprinting from shooting box to shooting box firing their race gun as they leave a trail of empty mags and cases flying in their wake. What is not generally recognized is the level of shooting expertise that some of the targets require in these courses. This brings us to crossover participation in both sports, which is a good thing since any trigger time is better than no trigger time. For a new shooter with a factory-standard double-action semiauto and strong-side concealment holster and mag carriers, if they meet the IDPA Stock Service Division rules, they should also meet USPSA's Production Division rules on guns and equipment. The only confusion will be the rules of engagement, as it were. For example, in IDPA when the gun needs to be (or is desired to be) reloaded, if the slide is forward (closed), the magazine being removed must be retained on the shooter's person or a procedural penalty is incurred. In USPSA the magazine can simply be dropped on the ground without penalty. Another difference between the two sports is the when and where of reloading. In a USPSA stage, you can reload wherever you care to, but in IDPA the stage descriptions often stipulate the where and when of reloading. These sorts of differences are great grist for the never-ending, never-to-be-resolved debates on their merits. One plus, however: Debating them does help pass the time while waiting to shoot. This is training. Here, police cadets learn the fundamentals of marksmanship while using cover. While USPSA and IDPA are the most self-defense oriented of the shooting sports, there are other worthwhile handgun-shooting venues. The oldest game, bull's-eye shooting, is still the best place to learn how to fire a well-placed shot. Handgun target shooting is very stylized in that the game is shot one-handed with highly refined handguns over fixed courses of fire, but the game does require self-discipline in that your goal is to fire a very well-aimed shot repeatedly. At the opposite end of the spectrum there are various steel-plate matches throughout the country where the targets are eight-inch steel plates, rectangles and lollipop or Pepper Popper (vaguely humanoid in shape) falling targets. Shooting steel is simply fun. You get to hear and see your hit with a target clang and a flop as it goes down. While at first glance this might look to be easy shooting, it's not since you still have to make well-placed shots--and quickly--for there's lots of steel in most courses where steel can be used. For those who might like something a little less demanding, Cowboy Action events are exactly what you make of them. The Cowboy game asks that you dress in period costumes (newcomers are welcome in casual garb though). The guns are single-action revolvers as well as rifles and shotguns of the type used in the Old West. You can expect to use all four guns: You should be wearing two single-action revolvers, firing first one and then the other, then switching to your scattergun and finishing off any remaining varmints with your pistol-caliber lever-action rifle. Targets are always relatively close, but you still have to hit them with all the action types. As to the why of competition for self-defense, my research shows that actions performed under stress imprint and hardwire your system such that those actions become reflexive. Competition provides this stress. It has often been said that men will spend more time and effort for a trophy than for self-defense. The trophy is immediate and within reach while using a handgun for self-defense is relatively remote, but if it does happen, you'll need all the skills you've got. Competition can also be enjoyable, meeting with old friends and making new ones who all talk guns. As the saying goes, "A bad day on a range is better than a good day anywhere else." So get out of that recliner, put down the remote, and get out there and compete.